The analysts have studied more than 30 directions of foreign policy: from cooperation with key partners and international organizations to public diplomacy. For the assessment of the foreign policy of Ukraine 5 criteria were applied, namely strategic vision, political interest/engagement, institutional cooperation, activities and results. The successes, as well as failures of the Ministry of Foreign Affairs, Committee on Foreign Affairs of the Verkhovna Rada of Ukraine and other institutions were assessed. The scores were given for their work, based on foreign policy merits and reverses. 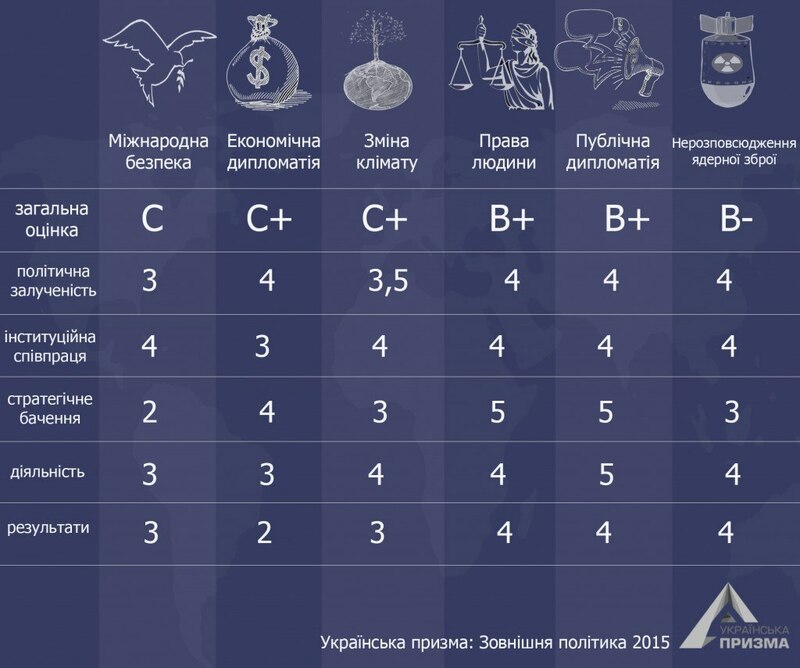 Foreign policy of Ukraine got “B-” score (A-highest score, E-lowest). The analysts consider absence of common strategy and political interest/engagement as a weakest component. In particular, foreign policy is not reflected in the programs of the political parties. Ukrainian efforts with regard to the EU and the USA got the highest scores, whereas cooperation with Russia, region of Latin America, and Africa was assessed worst. Therefore, the main recommendation of the experts is: it is considered expedient to elaborate a single document – “Priorities of the Foreign Policy of Ukraine towards 2020”. This is topical due to the fact that such a document is missing now. Besides, the analysts stressed the necessity of expert diplomacy. Together with the think-tanks MFA of Ukraine had better elaborate the mechanism of expert exchanges, study-visits for foreign experts that are interested in the events in Ukraine. 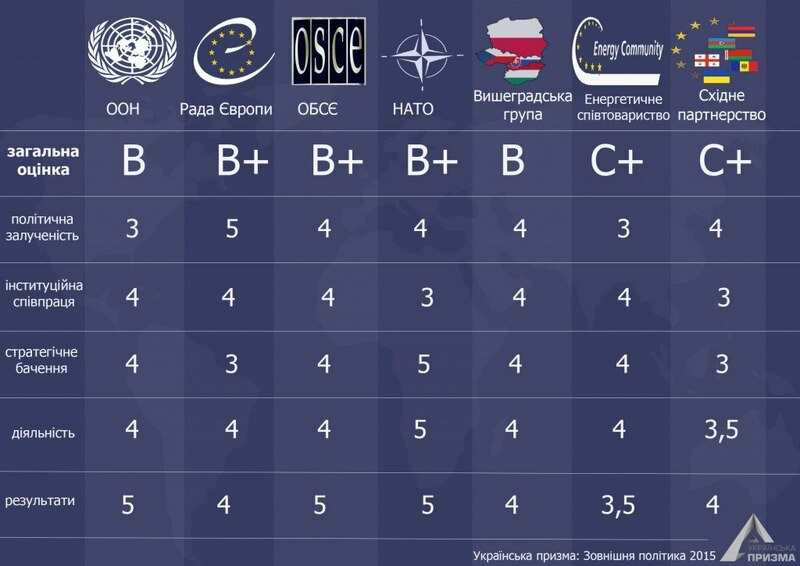 The scores coincided with the results of the expert survey of the Ukrainian and foreign analysts who in general rated the efforts of Ukrainian diplomats “C”. What is interesting is that both Ukrainian and foreign experts rated preservation of the support of the West best achievement of the foreign policy of Ukraine. Ukrainians consider Minsk agreements the failure of the year, whereas foreign experts think that absence of the reforms and results in fighting corruption as the biggest failure. This study will be annual that will allow watch the dynamics of work of Ukrainian institutions involved into foreign policy making. The involvement and interest of most of domestic policy actors in the foreign policy discourse was defned by the conditions of the armed confict in the East and the need to overcome Russian aggression. The direction of such involvement was formed by the approval of the European integration and Euro-Atlantic security initiatives as key priorities of the Ukrainian foreign policy. It is also important that in the context of credit and reform obligations, connection between internal and external policy increased substantially, particularly in obtaining credit and technical aid, implementing reforms. There was especially active political interest of the key players to Ukraine’s relations with the European Union, Poland, Canada, the United States, the Council of Europe, NATO, OSCE, France, and Germany. The economic and public diplomacy was important topic to discuss. At the same time, regional cooperation as a direction of foreign policy was engaged least of all, especially in such regions as Asia-Pacifc, Middle East, Latin America, and Sub-Saharan Africa. The Analytical report to the President’s Annual Address to the Verkhovna Rada of Ukraine describes in details the priority directions of the foreign policy, but it is not a binding document. However, despite the practical activity of particular members of parliament and their associations (”Eurooptimists”) in the key areas of foreign policy, it is worth noting traditionally low interest of political parties to the development of a full-featured block of political or election programs and to the formulation of a detailed part on foreign policy of the Coalition Agreement. Institutional cooperation during the studied period was defned by traditional division of competence in foreign policy, but in conditions of the confict, the NSDC’s role increased. Specifc forms of inter-institutional cooperation were established in the strategic areas, particularly in the context of creating the implementation mechanism for the Ukraine-EU Association Agreement and the Association Agenda updated in 2015. Some forms of interdepartmental institutional cooperation were envisaged by the Program of the Cabinet of Ministers of Ukraine in 2015, activity plans of relevant ministries to implement the government program, the Coalition Agreement and the Strategy for Sustainable Development “Ukraine 2020”. Also there was an update of some MFA regulatory documents on coordination of central executive authorities in terms of participation in international events. Deepened connection between domestic and foreign policy agenda contributed to the signifcantly increased level of cooperation between the MFA, the Administration of the President and the Verkhovna Rada of Ukraine in the institutional context of the Ukrainian Prism:Foreign Policy 2015 | 13 National Reform Council, the establishment of inter-institutional and inter-sectoral working groups on reforms, institutionalization of economic and public diplomacy (the Department of Public Diplomacy was established in the MFA), foreign media projects (project of the State target program on promoting Ukraine’s interests abroad and branding of the country in 2016-2018). The active position of some MPs who headed the VRU committees and participated in the VRU delegations to the parliamentary assemblies of the Council of Europe, the OSCE, in coordination of activities with the executive foreign policy structures, especially with the MFA, brought positive results in promoting Ukrainian interests and consolidated positive cooperation practices in relations with certain states: in 2015 inter-parliamentary groups were established not only with the EU countries (Germany, Poland, France, etc. ), but also in other regions (Argentina, Brazil, Cuba, Chile). The relevant committee of the Verkhovna Rada and delegations to the international organizations (permanent delegation to the Council of Europe, NATO PA, etc.) worked actively. At the same time, there were also conficts and competition, which led to ineffective implementation of certain directions of foreign policy. The problem in this context was the delay in the appointment of ambassadors to several countries and international organizations. Average level of institutional cooperation can be graded “4 -“. In 2014-2015 Ukraine updated a number of strategic documents in the area of foreign policy, security and defence. In 2014, changes were introduced to the Law of Ukraine “On the foundations of internal and foreign policy” of 2010, and during 2015 a new National Security Strategy of Ukraine and Military Doctrine of Ukraine were adopted. These documents radically changed the perception of Russia from a strategic partner to a aggressor state, recognized a long-term character of the Russian threat and the need for Ukraine to move towards joining NATO and the EU as the basis for security. For certain directions, bilateral documents of medium- and short-term nature were adopted; they substituted a full strategic vision of relations (Declaration of Heads of the State of Ukraine and France, the Action Plan for Ukraine for 2015-2017 inkey countries, weakens regional cooperation and implementation of the multilateral initiatives. Despite the Strategy for Sustainable Development “Ukraine – 2020” as a priority, the diplomatic reform was also not legislated in a single systematic document that would defne the direction and task of the reform. Average level of strategic vision can be graded “3+”. Activities Activities during 2015 were quite intense and generally met the stated priorities in the Coalition Agreement, the Program of the Cabinet of Ministers of Ukraine in 2015, the implementation plans of the Ukraine-EU Association Agreement, action plan to implement the Strategy for Sustainable Development “Ukraine – 2020” and others. The main directions of foreign policy predictably focused on resolving the confict with Russia (the Normandy format and the Minsk process, cooperation with the OSCE, the UN, bilateral relations with the United States, Germany, and France). The positive dynamics of political dialogue at the highest level, along with the presence of joint economic and energy projects, participation in joint multilateral initiatives, allowed recording signifcant foreign policy activity of Ukraine in relations with the UK, Canada, Poland, and the Baltic States. Cooperation with NATO became much more active. It is worth noting strengthening of foreign initiatives (meetings of intergovernmental commission on economic and scientifc-technical cooperation, Council of Europe, etc.). The EU-Ukraine Association Agreement was implemented according to the Action Plan on the Association Agreement Implementation for 2014-2017 and a number of other implementing documents. The Strategy on Sustainable Development “Ukraine – 2020” and the corresponding action plan of the Cabinet of Ministers on its implementation in 2015 also paid attention to certain directions and instruments of foreign policy. However, most geographic and thematic directions of foreign policy are not legislated in the strategy papers, thus they have no long-term vision. At the national level, there was no comprehensive vision of foreign policy priorities for the medium term perspective in a form of systematic document, which could be a basis for the development of most geographic and thematic directions of the Ukraine’s foreign policy. Such situation harms cooperation with the business forums, investment fodirections. In fact, the relations in the frames of the CIS were frozen, which are gradually transferred into bilateral relations with certain countries. Relations with China, India and Pakistan slowed down. Policy results on non-proliferation of nuclear weapons and climate change were weak. Average level of activity can be graded “4 -“. The greatest success was achieved in the European direction, where Ukraine has managed, despite Russian pressure to ensure ratifcation of the EU Association Agreement, also the EU-Ukraine Deep and Comprehensive Free Trade Area entered into force since January 2016. Also, in late 2015 the European Commission issued a positive final 6th report on the implementation of the Action Plan on visa liberalization, which gave Ukraine a perspective of obtaining a visa-free regime with the EU in 2016. At the key partners’ level, Ukraine had a successful year in relations with Canada, Poland and the Baltic states. A signifcant amount of humanitarian, technical and macro-fnancial assistance was obtained (EU, Germany, Japan, etc.). Election of Ukraine as a non-permanent member of the UN Security Council in October 2015 become a success in the context of cooperation with international organizations; and cooperation with the Visegrad countries had a signifcant impact on reducing Ukraine’s dependence onrums and economic conferences). Measures on information policy and public diplomacy were actively introduced, the MFA presence in social networks increased. The visit of the President to Israel was an important milestone. However, in 2015 Ukraine’s participation in the regional security initiatives weakened (including the “5+2” talks on Transnistria), participation in peacekeeping operations, anti-piracy, tasks within BLACKSEAFOR. Cooperation with the OSCE is actually limited to Ukrainian issues only and is passive in other Russian gas due to reverse from Slovakia, Hungary and Poland. However, despite the fact that the existing European sanctions against Russia were preserved, they were not stiffened. In the security policy, there was also a failure in obtaining the status of a special US ally outside NATO, ensuring allies’ agreement in principle to supply lethal weapons and peacekeepers of the UN or the EU at Donbass, forcing Russia to fulfl its part of the Minsk agreements, achieving signifcant progress on the occupied Crimea issue and getting clearer commitment of the European partners on the future prospects of the European integration of Ukraine. Trends on Western allies’ dissatisfaction with the course of Ukrainian internal reforms intensifed, there was a warning that further assistance will be conditioned by the internal transformations in Ukraine. In terms of economic diplomacy, the following documents are important: Agreement on signing the FTA with Israel in the frst half of 2016, initialling of the FTA with Canada and intensifcation of the talks on this issue with Turkey. However, despite the course to foreign policy economization and the signifcant efforts in terms of investment and business forums, the objective economic situation showed a further drop in decline in foreign trade, foreign investment and so on. At the same time, it was managed to avoid default by restructuring the external debt. Average level of foreign policy’s effectiveness can be graded “4 -“. In 2015, relations with the United Kingdom significantly intensified owing to its engagement into the processes of Ukraine’s internal reforms and development of its statehood potential. UK active support of Ukraine at international forums was important; yet, it was only supplementary, as this country did not engage in the main mechanism of conflict resolution and is generally playing a passive role in the foreign policy of the EU. Also, the relations were developing in absence of the Ukrainian party’s strategic vision. 2015 saw Ukrainian Foreign Policy under the sign of unity concerning the vision and implementation of strategic policy regarding Canada. Intensive contacts at the high and highest levels helped initialing of the Free Trade Agreement and extended Canadian assistance in the financial, technological and military technical spheres. In 2015, Kyiv and Beijing managed to make a number of important steps for normalizing their relations and returning to implementation of the tasks planned in the strategic documents as of 2013. Owing to the efforts of the Ukrainian authorities, some directions of practical interaction with China that were under threat of failure after 2014 were restored. But the risks of contracts breach still remain and the political dialogue is rather sporadic. During 2015, Ukraine and Germany experienced an unprecedented intensity of political contacts, in particular within the framework of the Normandy format of negotiations concerning settlement of the situation in the East of Ukraine. The Federal Republic of Germany significantly intensified its financial and economic/investment support of Ukraine. At the same time, the Ukrainian party shows a certain lack of a realistic approach in the relations. In 2015, there was a considerable intensification of relations between Ukraine and Romania. For the first time in the last 7 years, the President of Romania came to Ukraine with an official visit. Romania consistently supported Ukraine on the bilateral level and in international organizations. In 2015, Ukraine perceived the United States as its main strategic partner and coordinated with them the issues of both foreign and domestic policy. Still some directions of the interaction — trade, investments, security guarantees from the United States — are somewhat lacking for a strategic partnership. The year 2015 laid the foundations for intensification of Ukrainian-Turkish relations in the form of negotiations concerning the Agreement on the Free Trade Zone, cooperation in the sphere of the regional security and power industry, etc. It can be considered as a belated preparatory stage for the long-declared strategic partnership with Turkey. At the same time, the impediment factors still are the discordance of countries’ positions concerning the future of the regional security system, cooperation with Russia and the energy security. The year 2015 brought the breakthrough in French-Ukrainian relations: number and quality of contacts spiked, new directions for cooperation emerged. However, the crisis-related nature of this enhancement and differences in the two countries’ strategic targets render the cooperation unstable, and this became evident after the Paris terrorist attacks on November 13. The main task is still to find the strategic framework to align the interests and enhance the economic and informational components of bilateral relations. The year 2015 showed that Ukraine and countries of the Visegrad Group (V4) are interested in further development of their relations. This is manifested in institutional cooperation between Ukraine and these countries in all spheres of social life, which has been already formalized in treaties and agreements, and in concrete examples of cooperation in the region. The V4 countries express interest in providing assistance in reforming of various spheres of the Ukrainian state, but sometimes there is an impression that Ukraine neglects to observe its interests, leaving them to volition of its Western partners. 2015 saw significantly intensified cooperation between the Energy Community and Ukrainian authorities, first of all, the Ministry of Energy and Coal Industry of Ukraine, in elaboration and approval of legislative drafts and legal documents regarding reform of the energy sector. The ambitious agenda of relations between EU and Ukraine in 2015 was mostly implemented. The EU’s financial support to Ukraine, along with the sanctions against Russia enabled a certain political stabilization in the country. Yet, the slow process of implementation of reforms and corruption scandals cause discontent of European structures and some member countries, and this makes the positive results from EU’s support in 2015 a notable manifestation of political good will. In 2015, the dynamics of relations between Ukraine and the Baltic states remained quite high. High- level visits were exchanged. The Baltic countries consistently supported Ukraine on bilateral level and at the forums of international organizations. The following events in Ukraine’s relations with the countries of the Eastern Partnership should be considered as key events: Eastern Partnership Summit in Riga (May 2015); deepening political dialogue with Moldova and Georgia in the context of the common goals of European integration and security in the region; intensifying political cooperation with Belarus; achieving fundamental positions on economic relations in the context of a free trade zone between Ukraine and the EU and beginning of a new stage of dialogue with Azerbaijan. Despite a low level of political interest to the issues of cooperation with the UN, except for some problems of conflicts resolution and human rights protection, this organization is clearly positioned in the strategic documents and holds a significant place in Ukraine’s foreign policy. Intensive activities of the Permanent Mission of Ukraine to the UN in 2015 led to a significant achievement — election of Ukraine as a non-permanent member of the UN Security Council for 2016-2017, which was the cause of the Results’ highest rating. In the course of 2015 there could be seen cooperation with the Institutions of the Council of Europe (The Committee of Ministers of the Council of Europe, the Parliamentary Assembly of the Council of Europe, the Congress of Local and Regional Authorities). The Action Plan for Ukraine 2015-2017 was agreed upon, with its implementation being financed by the representatives of the European Commission in Ukraine in the framework of the Eastern Partnership funding. Despite the high level of activity and the Commissioner for Human Rights’ visit to Ukraine, the monitors of the Council of Europe did not have the access to the occupied Crimea. Ukraine’s cooperation with the OSCE in 2015 was marked by a high level contacts, visits and interaction within the framework of different institutions. The most active one was the interaction with the OSCE Special Monitoring Mission, the participation of Ukrainian representatives in the Trilateral Contact Group on the peaceful settlement of the situation in Donbas. Yet there is a problematic issue concerning the full implementation of the mandate of the Special Monitoring Mission, monitoring on the entire territory of Ukraine including the Ukraine-Russia border territories and the temporarily occupied Crimea. At the same time, Ukrainian activities regarding other OSCE priorities and Ukraine’s involvement in resolving other issues in the framework of the OSCE outside the country is minimal. Ukraine’s cooperation with NATO is one of the key issues of its foreign policy agenda in 2015. Despite different approaches of some political parties to the issues of the further Euro-Atlantic integration, Ukraine’s decision to abandon its non-bloc status gave a significant push towards invigoration of cooperation that was taking place at the level of the President, Parliament, Cabinet of Ministers, and other governmental agencies. Conducting negotiations, coordination of positions, signing joint roadmaps and the Trust Fund Agreement, and regular joint military exercises provide grounds to give a good rating to the Ukraine-NATO cooperation. Year 2015 showed that Ukraine has a rather limited set of foreign-policy and security tools for influencing Russia’s aggressive policy against Ukraine. Destruction of the bilateral international treaties framework, winding down the economic and institutional cooperation make the Russian direction of Ukraine’s foreign-policy activities unattractive for individual political investments of the Ukrainian ruling class, and take away the middle-term perspective of the interstate relations. Among the key events in the relations of Ukraine and APR in 2015 was a notable progress in achieving mutual understanding with China, extension of cooperation with Japan, and several other countries of the Pacific. The Ukrainian party sent a positive signal by the long-awaited appointment of ambassadors to a number of key countries. In 2015, the Middle East was on the periphery of the Ukraine’s foreign policy. There was an exception – development of relations with Israel, Turkey and Arab monarchies, which are acknowledged as priority countries of the region for cooperation. In 2015, the human and resource potential of Latin America was under-evaluated by the developers of the foreign policy strategy of Ukraine in this region. This caused decline of the indicators of Ukrainian export, some image losses (absence of political support to Ukraine in the issue of counteracting the Russian aggression from the power elites, in particular those of Cuba, Argentina, and Brazil), as well as impossibility to confront Russia’s influence on the situation around implementation of the joint Ukrainian-Brazilian project «Alcantara Cyclone Space». In 2014, Ukraine renounced presidency at the CIS, and in 2015 a totally expected considerable decrease in the level of relations between Ukraine and institutions, and countries of the CIS took place. Considering the fact that Ukrainian membership in the CIS is mainly formal, de-facto Ukraine makes its policy to minimize its representation in the organization, where еру Russian Federation plays a key role. Relations between Ukraine and the CIS-countries are shifted to a bilateral format. The year 2015 showed that Ukraine is interested in development of relations with the countries of Africa. It shows both in Ukraine’s institutional cooperation with the countries of the African continent in all spheres of social life, which has already been formalized in the treaty framework, and in concrete examples of Ukraine’s activities in African countries. Yet, in spite of all this, a clear manifestation of Ukraine’s interests in the region is still absent. The Black Sea region has almost disappeared from Ukraine’s foreign policy agenda in 2015. Significant reduction of goods turnover with all countries of the region, freezing of the significant number of multilateral projects, absence of ambassadors in some countries and disregard for multilateral mechanisms form a negative tendency. In fact, Ukraine’s policy was concentrated only on the issues of security connected to the annexation of Crimea and on relations with Turkey and Romania, and sustained a significant loss of support from the countries of the Caucasus. Due to the focus on its domestic events, Ukraine was not, in fact, present in the international discourse on security issues. Decrease of involvement in peacekeeping operations is an objective factor, while the lasting absence of an Ambassador-at-large for Transnistrian settlement, where Ukraine is one of the main mediators, is the factor that negatively affects the image of Ukraine. In fact, most of the statements of Ukrainian politicians and official agencies either were about Euro-Atlantic prospects of the country, or were a response to violations of international security with references to Ukraine (Syria). To protect its sovereignty and territorial integrity, in the reporting period Ukraine was actively discussing the commitments of the parties to Budapest Memorandum. Ukraine applied maximum efforts to prevent proliferation of radioactive materials and technologies from the occupied territories. In 2015, Ukraine worked on: evaluation of the capacity of the state and of the economy to undertake new commitments within the framework of preparation for the Paris Climate Change Conference; implementation of greenhouse gas emissions reduction projects using the so-called «Kyoto money» from Japan and Spain; the foundations of the state policy in the sphere of climate change; development of the mechanisms of emissions trading and complying with the environmental commitments within the framework of membership in the Energy Community. Quite modest achievements in most fields can be explained to a significant degree by the systemic problem of both the political and governmental structures — poor competence and no sense of responsibility. In 2015, the Ministry of Foreign Affairs of Ukraine and the Office of the High Commissioner of the Verkhovna Rada of Ukraine for human rights showed a high level of activities, including international cooperation for ensuring Ukraine’s international commitments in the sphere of human rights, as well as special attention to violations of human rights on the occupied territories of Ukraine. The main mechanisms used for promotion of the issues of human rights observance in Ukraine were the OSCE institutions, sessions of the UN General Assembly, the United Nations Human Rights Council, and Sessions of the Parliamentary Assembly of the Council of Europe. The year 2015 did not become a breakthrough for Ukraine’s economic diplomacy – with the domestic situation this complicated it is quite difficult to count on success in the foreign economic policy. First steps were made to create additional favorable trade regimes and foundations of institutional support of economic diplomacy were laid.